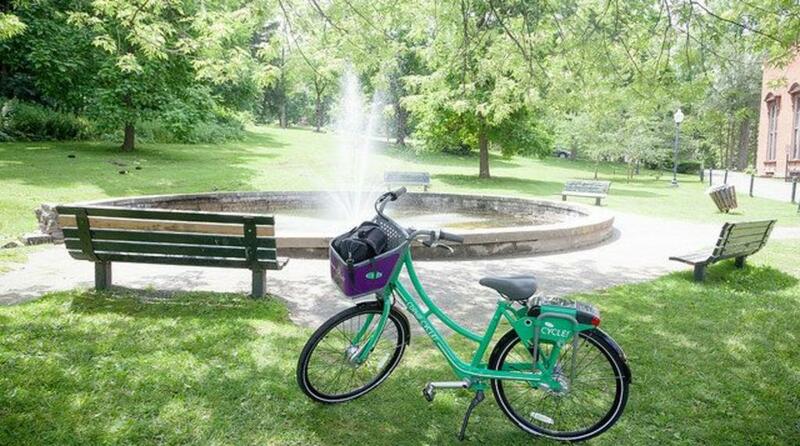 Summertime, and the travelin&apos; is easy with CDPHP Cycle! You may have noticed some colorful additions to several Saratoga street corners this summer. 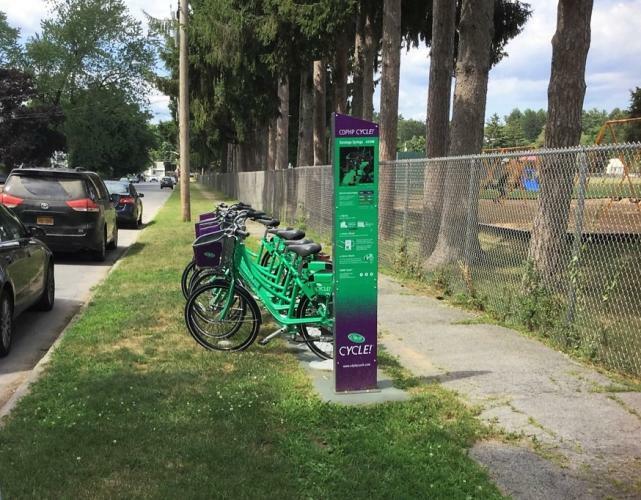 There are now 13 hubs for Saratoga&apos;s Bikeshare, CDPHP Cycle!, marked with signature bright green and purple throughout the city. A 14th will be added at the head of Railroad Run before the end of the summer. In its second year, CDPHP Cycle! is wildly popular, with more than 4,000 members, and growing! It seems like the international enthusiasm for bike-sharing has arrived at just the perfect moment in the Spa City, as talk of bike lane additions and trail system expansions are swirling around the city. Even with these additions on the horizon, there are SO MANY great ways to use a CDPHP Cycle! bike in town. One of the most popular spots is the Saratoga Spa State Park, and getting from town to the park is a cinch on a bike - just head down Railroad Run on the West Side of town, and, voila!, you&apos;ve made it! Biking to the park avoids traffic, parking, and park fees. You could even take a CDPHP Cycle! to a SPAC concert, and lock it at the hub right outside the Spa Little Theatre. And, with the growing network of hubs across town, using CDPHP Cycle! to avoid track season congestion is a realistic option. Just download the free app and, after setting up an account, check to see where available bikes and open hubs are, so you don&apos;t have to squeeze a car into downtown. It can be a bit intimidating to use anything new for the first time, but CDPHP Cycle! keeps things relatively simple. They are part of the JUMP bike network, which means their bikes use the same system as Blue Bikes in NOLA, BIKETOWN in Portland, and Greenride in Burlington - just to name a few. Prices (including a solid 50% discount for students), as well as detailed instructions for registration and use, can be found online at CDPHP Cycle! The low-down? There are three different user levels: hourly (prorated per minute), monthly, and seasonal (these last two both entitle the user to 60 free minutes a day and, if you go over that amount, it is $5/hour). 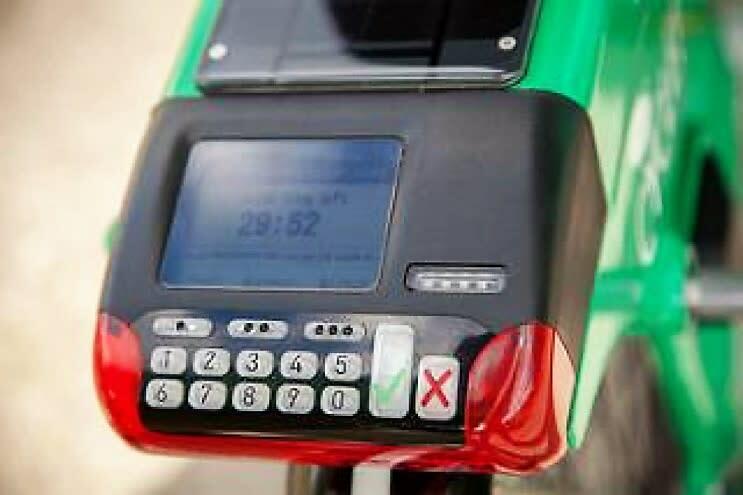 With each package, simply register through the app or website, and enter your account number and PIN (which will be provided to you) on the keypad at the back of the bike. 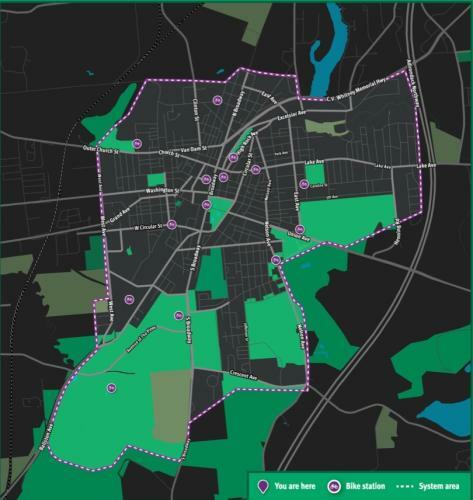 With all the events across the city this summer, it is the perfect time to try out the system, and see if you&apos;ll join the many who love to cycle Saratoga. For a more relaxed trip, try the FREE summer trolley - another great way to get around without the hassle of parking or traffic. 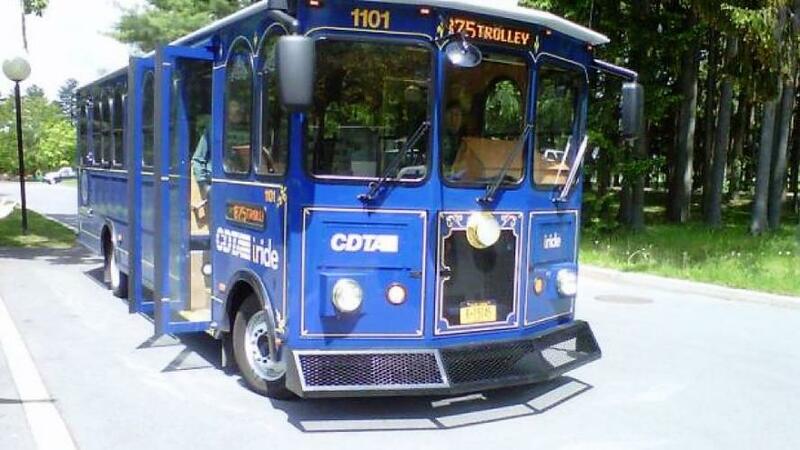 Every summer, from July 1st to August 3rd, CDTA runs a trolley from the North end of town (the Courtyard Marriott), to the Casino Hotel. The route&apos;s stops, marked with blue and white sandwich boards, include locations along Broadway and Lincoln Ave, as well as the Saratoga Race Course (full schedule with real-time arrivals here). It runs from 11am to 11pm every 30 minutes; you can even download the cityfinder app to track trolley arrivals to get there just in time. Whether it completes a leg of your journey, or takes you all the way to your destination, the trolley gives you the flexibility to enjoy the city with any combination of walking, biking or riding. All you need to bring is yourself! *Header photo courtesy of the CDPHP Cycle! Facebook page. Emma Hopkins is an undergrad at Princeton University, and is interning with the City of Saratoga Springs Planning Department this summer.